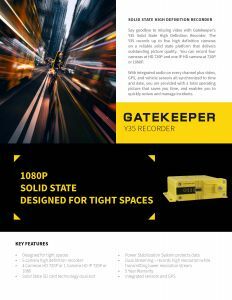 Gatekeeper’s Y35 high definition digital recorders combined with G4 Vision software provides school bus operators with an on-command connection centralizing communications for system health check, driver behaviour analysis, video management, live streaming video, GPS, routing and mapping, student tracking and other third-party software applications. The Gatekeeper Y35 is a 5 channel (4 AHD / NTSC analog, 1 IP) video/audio recorder. The four analog channels can be configured in pairs as either AHD or NTSC channels. When configured for four NTSC analog channels, each channel will record a maximum of 30 FPS simultaneously with independently selectable resolutions and 9 quality levels. When two channels are configured for AHD, the DVR will support 15 FPS each of the 2 AHD channels and up to 30 FPS on the two NTSC analog channels. Analog High Definition camera utilizes Gatekeepers standard analog cables. This allows vehicles with existing analog compatible cabling to be easily updated to high definition cameras. 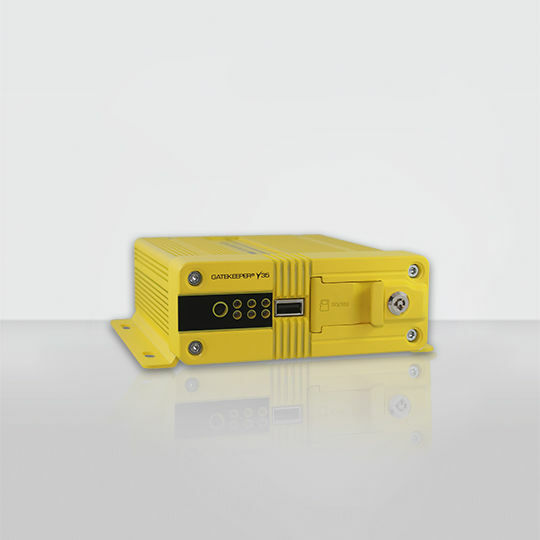 The Y35 AHD DVR supports the AHD-M video standard. When combined with Gatekeeper’s S31AHD camera, video resolution is increased from standard D1 (720×480) to 720p (1280×720) high definition resolution. 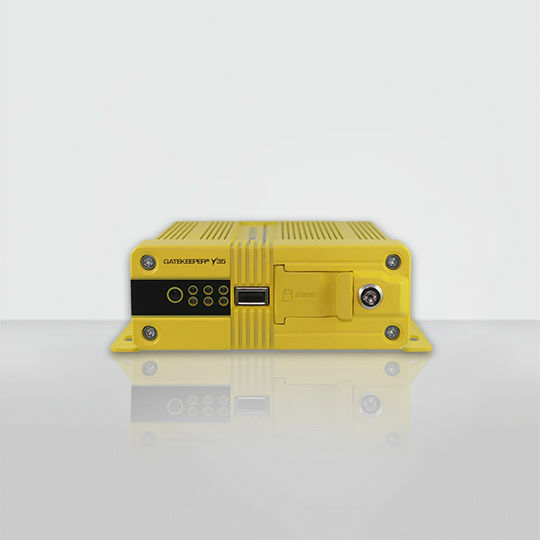 The Y35 AHD DVR also supports the 960H (928×480) video standard. The Y35 AHD has dual SD card slots and can accept up to 256GB SD card in each slot (512GB total). The Y35 AHD incorporates many features that dramatically increase the reliability of the DVR and the availability of recorded video. A custom file system is used to record data to the hard drive. This file system has been designed so that video can be recovered under most scenarios. 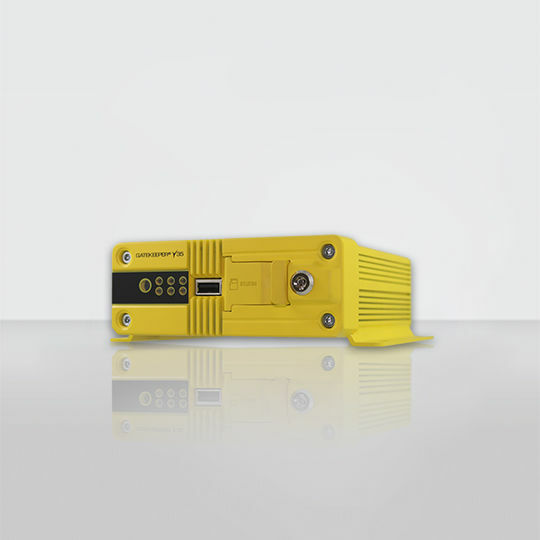 The Y35 has a high capacity power supply. The power supply stores energy so that if the DVR loses power (when the engine is started or other high current draw electrical devices are turned on, such as air conditioners or hydraulic lifts), there is enough energy in the power supply to continue to power the internal circuits of the DVR for a short period of time. For example, when power to the DVR is lost the DVR closes the video files correctly and then power down into a safe low power state. This makes the DVR virtually immune to the notorious unreliable power found in vehicles. The Y35 has latched door that prevents users from inadvertently removing the Caddy (hard drive carrier) befor powering down the DVR. The key must first be turned to the unlock position before the door can be unlatched and opened and the Caddy can be removed. When the door is unlatched and opened, the DVR shuts down, and it is safe to remove the Caddy. After the Caddy is reinserted, and the door is closed and latched, the DVR reboots and is once again ready to record. The Y35 DVR passes MIL SPEC 810F (Trucks on Streets) for shock and vibration. 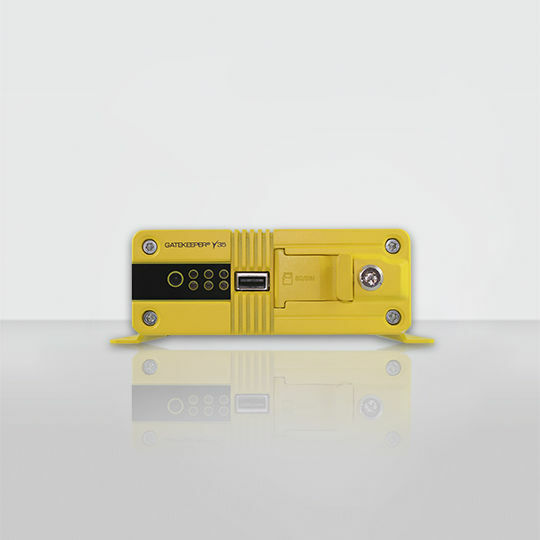 In addition, Gatekeeper has developed and subjected the Gatekeeper DVRs to custom shock and vibration profiles. These profiles were derived by placing sensors on vehicles, and recorded the shock and vibration that actual DVRs were subjected to in real world conditions. The Y35 allows users to download video and/or video of marked events to a USB memory stick that can be inserted in the front of the DVR. The Y35 is WiFi Ready. Gatekeeper’s WiFi system will provide radio coverage in a typical vehicle yard. 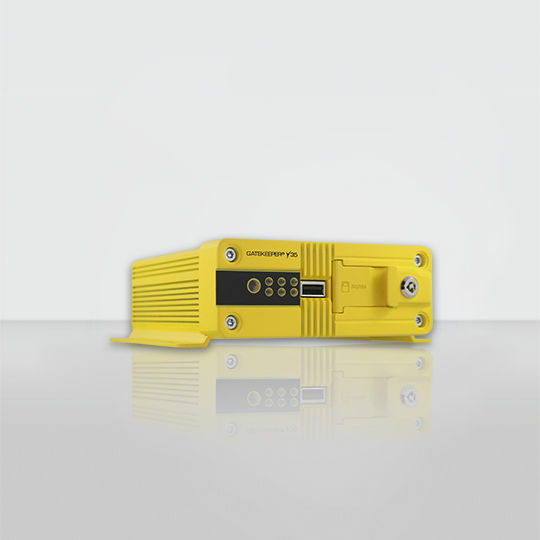 Utilizing WiFi 802.11n at 5GHz Gatekeeper offers both a rugged industrial rated access point and a WiFi radio for the vehicle. Through the use of Auto Wake, a user can turn on the DVR and WiFi radio in the vehicle so that video can be accessed. The Y35 is dual streaming. This means a high quality full resolution image can be stored on the SD card while a lower resolution image can be streamed over the optional cellular connection. Video Channels IP 4 channels (AHD or NTSC Analog) configured in pairs.